Microsoft said Friday that while two older midrange Lumia phones will receive its Denim update in just a few days, Lumia Icon owners will have to wait until 2015 to receive it, breaking an earlier Microsoft promise. 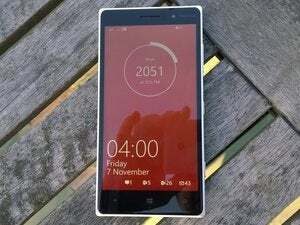 Microsoft said Friday that the Lumia 822 and Lumia 928 would receive the Denim OS upgrade in the next few days. The phones are old: The Lumia 928 is a midrange phone from June 2013, and the 822 also dates back to mid-2013. But the newer, better Icon will have to wait until “early 2015” to receive it. Microsoft said it would follow the limited Denim rollout with a broader one in the new year. “A wider rollout of Lumia Denim to all Lumia smartphones running Windows Phone 8.1 is expected to begin in early January," Microsoft said in a blog post, "following partner testing and approvals.” Despite the carrier reference, however, Microsoft representatives wouldn’t say whether Verizon was behind the delay in the upgrade. Why this matters: The Lumia Icon is the closest thing Microsoft has to a flagship device, even though it’s about ten months old. If the best Windows Phone isn't first in line for an eagerly anticipated upgrade, that can't help the mood within the Windows Phone community (even though it’s probably Verizon that's holding things up, not Microsoft). It doesn' help that recently Ed Bott, a technology writer for ZDNet, and Tom Warren, a writer for The Verge, both publicly abandoned Windows Phone within days of each other, based on OS and app delays.